Problems have kept former WWE star out of action. 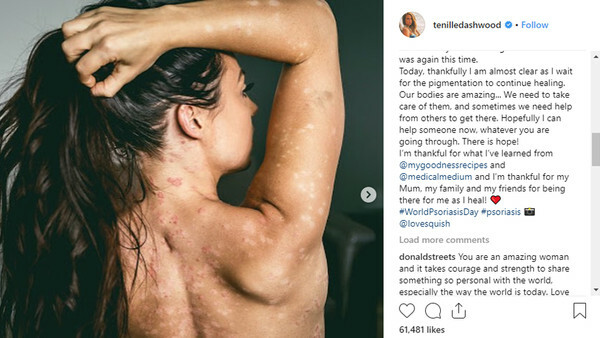 Former WWE superstar Tenille 'Emma' Dashwood has bravely shared a series of photos on her Instagram account chronicling her ongoing battle with psoriasis. The Australian revealed back in August that she has been living with and managing the condition since she was 14 years old, but that a recent flare up has unfortunately kept her out of action in recent months. In a bid to provide inspiration to others, Dashwood made the courageous decision to expose her vulnerability on her social media account, with a series of images candidly revealing her skin condition. "The physical damage is rough yes, but the mental and emotional damage far outweighs that. You just never know what someone is going through," wrote Dashwood. She went on: "Lately I’ve realized that sometimes we need some help, some encouragement, someone to speak to. We need to hear there is hope, and to know that things can get better." Psoriasis is a skin condition which causes red, flaky patches of skin as a consequence of heightened skin cell production. At its most severe, the condition can cause severe physical discomfort, and considerable damage to the sufferer's self-esteem. In uploading these pictures, Dashwood offers encouragement to those going through a similar condition - and provides a reminder that it's absolutely nothing to be ashamed of.